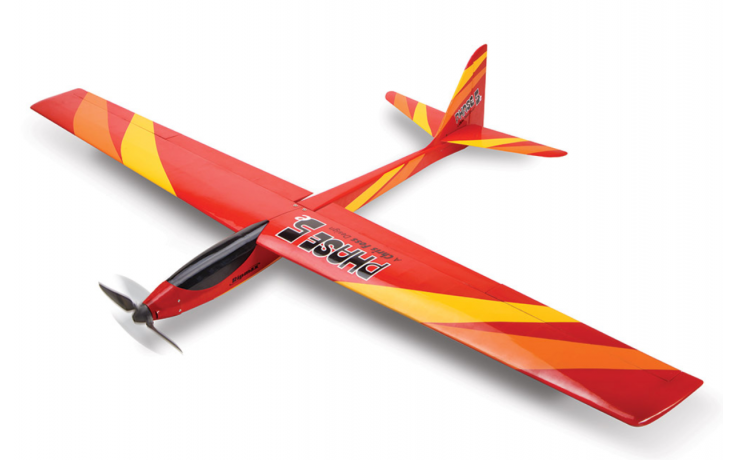 The Chris Foss Phase5-E is an extremely versatile sport glider. The effecient aerofoil allow you to soar around hunting thermals with power off but the powerful controls allow for extremely spirited aerobatic displays. The airframe itself is factory built using jigs to ensure accuracy from a combination of balsa and plywood. The finished airframe is then covered for you in a high quality heat shrink film in this bold red design. The tailplane is fully moving, so to aid construction the mechanism is pre-installed in the fuselage at the factory so that you can get flying in less time. With our recommended components the equipment installation is a breeze and the performance will knock your socks off! Using our power system the Phase5-E can will climb infinately out of sight at full throttle and pull the airframe through any aerobatics you throw at it. The recommended Quartz servos provide ample power and a sharp accurate response for precision manouvers.